Glasgow's new 'Riverside Museum', a photo by PhylB on Flickr. We took the girls down to the new museum the other day because they are going stir crazy with their siblings away in France (and we were over that way taking mum to a hospital appointment anyway). 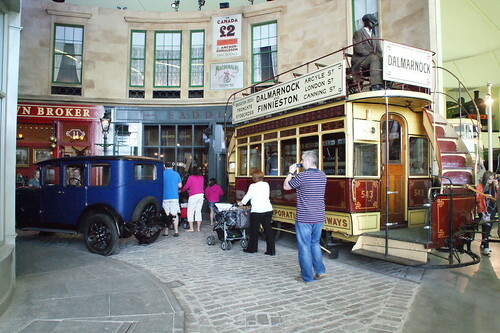 They all loved the old transport museum so had been missing it, but its new incarnation is far more dynamic. Anna just loved going inside the old trams and tube trains and pretending she was going on holiday. She loved going into all the old shops in the little street too. She could happily have spent the whole day there. The new building is great and in a lovely position, though they have way under-estimated the size of the car park and it is quite far to walk from their nearest suggestions, especially if you have small kids or elderly people along. I assume they'll slowly iron out that wee problem though so am looking forward to many happy returns.